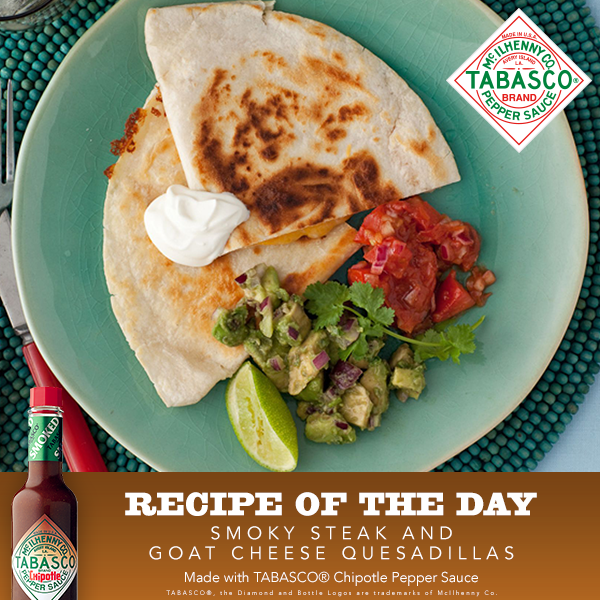 This Smoky Steak and Goat Cheese Quesadilla recipe made with Tabasco® Chipotle Pepper Sauce will bring the fiesta in your mouth! 1. Place steak, TABASCO® Chipotle Sauce, garlic, and lemon juice in a sealable plastic bag and mix well; refrigerate at least 8 hours and up to 30 hours. Preheat grill to medium-high. Grill steak to desired doneness, about 5 minutes per side for medium. Let steak sit for 5 minutes and cut into ¼-inch-thick slices. Set aside. 2. Heat a nonstick skillet over medium heat. Brush one side of a tortilla with oil and place oil side down in skillet; sprinkle tortilla with 1 ½ tbsps cheese and top with ¼ cup sliced steak. Top with another tortilla and brush with olive oil. Cook until golden brown on bottom, about 90 seconds. Turn and cook until other side is golden and cheese is melted, about 1 minute. 3. Keep quesadilla warm in oven while preparing five more with remaining ingredients. Cut quesadillas into quarters and serve with sour cream, salsa, and guacamole.